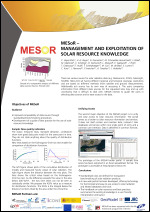 Models converting satellite images into the different radition components become increasingly performing and give often better estimation of solar irradiance availability that ground measurements if the station is not situated in the near vicinity of the application. 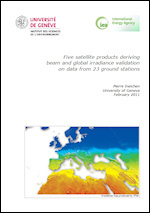 Five different satellite products deriving both global and beam irradiance are validated against data from 23 ground sites. The main conclusions are: - the global irradiance is retrieved with a negligible bias and an average standard deviation around 16% for best algorithm. For the beam irradiance, the bias is around several percents, and the standard deviation around 35%, - the main deviation comes from the knowledge of the aerosol optical depth, - the high latitude sites give not poorer results than the other sites. Knowledge of the solar energy resource is essential for the planning and operation of solar energy systems. 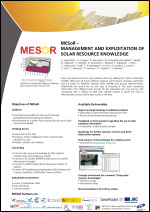 There are a large number of different data sources available which makes it difficult for the non-expert in solar resource assessment to judge which source might be appropriate for a specific application. The United Nations Environmental Programme (UNEP) therefore supported the development of a Guide which will help users to make an educated decision about which data set to choose among several different available. The Guide basically consists of two tables. The first one is a description of the data sources. The second table consists of recommendations of minimum requirements in the characteristics of the data depending on different applications. 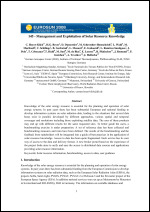 Knowledge of the solar energy resource is essential for the planning and operation of solar energy systems. 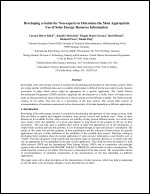 In past years there has been substantial European and national funding to develop information systems on solar radiation data, leading to the situations that several data bases exist in parallel, developed by different approaches, various spatial and temporal coverages and resolutions including those exploiting satellite data. By comparing these products the users may end up with different results for the same requested sites. The MESoR project has defined a number of benchmarking measures and rules and applied them in several benchmarking exercises. 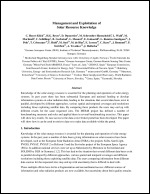 This paper will show key results. To ease access to the data a new broker portal has been developed. The paper will show how it can be used to retrieve data or to make data available within the portal. In this paper new comparison parameters are defined for assessing statistical similarity between two data sets. The new parameters are based on the commonly used Kolmogorov–Smirnov test. They allow quantifying differences between the cumulative distribution functions of each data series. These parameters are applied to global horizontal daily irradiation values from pyranometric measurements and satellite data. The test data from 38 stations distributed throughout Germany cover the time from 1995 until 2003. The results affirm that the new parameters contribute valuable information to the comparison of data sets complementing those that are found with the mean bias and root mean squared differences.